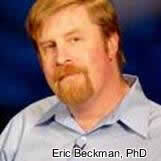 Regenerative Medicine Today welcomes Eric Beckman, PhD. Dr. Beckman is a professor of chemical engineering at the University of Pittsburgh and the co-founder of Cohera Medical, Inc. Dr. Beckman discusses the technology that is being developed at Cohera Medical, Inc. as well as the difficulties faced when starting a small company. For more information on Dr. Beckman, click here.